For the harried home cook, appliances such as slow cookers and electric countertop roasters are a boon. Not only are they easy and convenient to use, they won't heat your kitchen the way a full-sized oven does when making dishes that require long, slow cooking. This is especially welcome in summer, when heating up the kitchen for hours on end is an unattractive proposition. 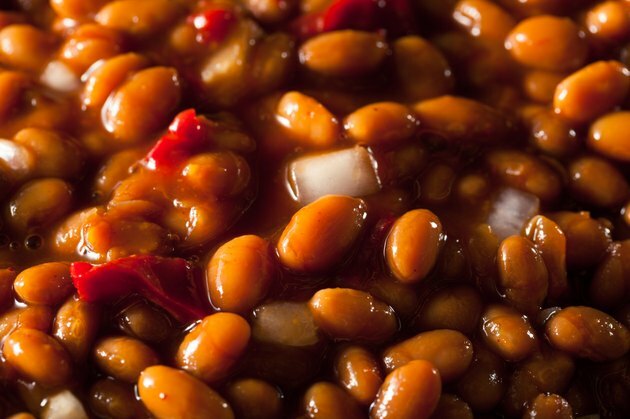 For some dishes, such as baked beans, a countertop roaster is the most practical way to prepare them in bulk without causing the cook to melt in the process. Pour the Great Northern beans into a large bowl, and pick out any stones, broken beans or other debris. Fill the bowl with cold water, and remove any beans or chaff that float to the surface. Drain and repeat, until nothing more floats to the top. Add 2 tablespoons of salt to the beans and soak them overnight. Salt during cooking prevents the beans from becoming tender, but food science writer Harold McGee established that salt during soaking shortens cooking time. Drain the beans, and pour them into your roaster. Fill the roaster with enough fresh, cold water to cover the beans, and turn it to 300 degrees F. When the water begins to bubble, but hasn't yet boiled, reduce the heat to 195 degrees F.
Cook the beans until almost tender, usually 1 1/2 hours or less unless the beans are very old. Add your flavorings, such as molasses, salt pork, dry mustard, ketchup, brown sugar, onions and garlic. Sweet or acidic ingredients will keep the beans from softening, if added earlier. Continue simmering, stirring occasionally, until the flavors are well blended and the beans are soft and creamy in texture. Add water in small amounts, if necessary. Stir the beans thoroughly, once they're cooked, and the starch that's cooked out of the beans will thicken the sauce slightly. To make a thicker sauce, mash some of the beans. Turn the roaster to its minimum setting, and serve the beans hot from the roaster. The same technique works for any dried bean, though the cooking time will be longer. Five pounds of beans yields roughly 10 to 11 quarts of finished beans and sauce, enough to fill the roaster 2/3 full but still leave room for stirring. this quantity of beans will serve up to 70 or 75 as a side dish. If necessary, you can use a sixth pound of beans, but you'll need to be careful when stirring. You can adapt any slow-cooker bean recipe to the electric roaster by scaling up all the ingredients to the correct quantity. Set the roaster to a temperature of 200 degrees F. Conversely, you can convert any conventional roaster recipe to slow-cooking by reducing the temperature to 200 degrees F and tripling the cooking time.